(Text automatically translated) Ideally located on the Grande Corniche between Nice and Monaco, in a green area overlooking Observatory NIce with views of the Alps, the typical Nice house that we offer has been carefully renovated in 2008. It has a large garden and two terraces (east and west) of more than 30m2. Great accommodation , nice pool, great hosts. "Excellent stay overall, very friendly owner and great for families with kids of different age as there are lots of toys, games, books, table tennis, small football field and our kids played a lot with the kids of the owner. There are hiking trails nearby. Slight issues - while fairly quick drive to the beach - about 15 minutes, but the roads around are quite narrow and steep. The kitchen and barbecue required cleaning. Nearest boulangerie is not very good and there is lack of restaurants with children menu nearby." "3 adults an 2 kids staeyd here quite nicely. We would definetly think coming back again an recoment this to othet people." "We have spent a great holiday in Nice. The house is so cosy, clean and spacious. The garden is beautiful and well maintained. We have enjoyed the pool every day. The family there was extremely helpful and kind. They have warmly welcomed us and have been very helpful. They were very patient with our children and their garden is perfect for relaxing and also for entertaining the kids, especially the cubby house and the incredible flying foxes. The property is well situated and it is easy to go all around from there. 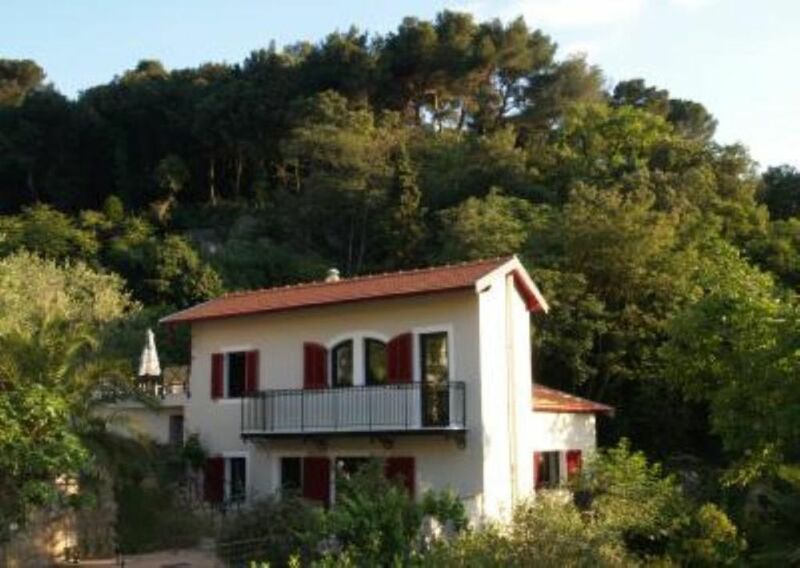 I can sincerely recommend this house to anyone willing to enjoy a stay on the Riviera." We had great 2 weeks at this location. The Hosts are so nice and helpful, we felt being a part of the family. A bus station is just a couple of meter away with which one can go directly to the city or a beach. Nous avons passé de belles vacances dans cette superbe villa située dans un cadre magnifique (dans la montagne avec un décor vert +++). Tout y est pensé pour la famille ! Les enfants (même nous parents) se sont éclatés avec les jeux intérieurs (jeux de société à profusion et lecture en tout genre à volonté) comme avec les jeux extérieurs (tyrolienne, cabane à jouets qui est une mine à trésors, filet de badminton, goal de foot, kicker, ping-pong). Les propriétaires sont accueillants et toujours disponibles pour un conseil ou une information (au niveau des magasins, des visites, des bons plans). Ils sont également très discrets. La piscine à partager n’a jamais été un problème ! La maison est propre, bien agencée et équipée. Nous la recommandons les yeux fermés. Et encore un grand merci Bénédicte et Eric pour ces belles vacances qui nous ont permis de découvrir Nice et Monaco et surtout de passer de beaux moment en famille. Votre hospitalité et votre écoute nous ont ravis et merci aussi à vos enfants qui, à votre image, se sont toujours montré très souriants et discrets. Nous reviendrons sans aucun doute !! (Text automatically translated) From the A8 motorway, exit at La Turbie and take the direction of Nice by the Grande Corniche (D2564). Skip the Col d'Eze then come to Col 4 Chemins the house is in front of the restaurant "La Chaumiere"
(Text automatically translated) Hiking in the Regional Park of the Grande Corniche from home. Access to the city center by bus and tram within 20 minutes. Villefranche, Eze and Monaco are less than a quarter of an hour from home.